The Stark Online: New Blitzen Trapper: "Heaven and Earth"
New Blitzen Trapper: "Heaven and Earth"
[mp3] Blitzen Trapper: "Heaven and Earth"
Blitzen Trapper's Furr was one of the best albums of '08, and yesterday we got a taste of their new album Destroyer of the Void which comes out June 8th on Sub Pop. 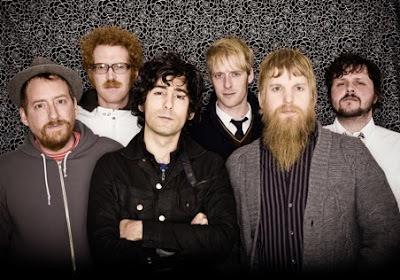 Blitzen Trapper is largely the brainchild of lead singer Eric Earley, but has always occupied two songwriting worlds; with one half channeling a psyched-out rock version of Americana, and the other a softer more backwoods style of folk. Sometimes, this dichotomy succeeds, while at others leads to inconsistent output. From the first listen, it seems Blitzen Trapper will continue further down the (much better) road towards 70s flavored folk-rock perfection, with with M. Ward / Bright Eyes producer Mike Coykendal at the helm and even featuring one of our favorite vocalists Alela Diane. Tracklist and tour dates after the jump.